Today I'm surprising one of my best friends and a few lucky co-worker friends with a Valentine. 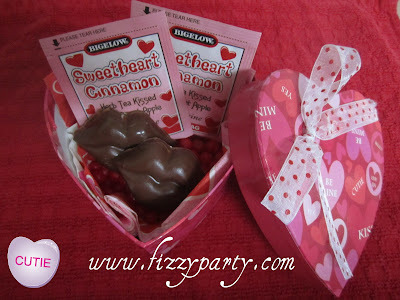 I have no kids to prep Valentine's for but I do like adding a little Fizzy to my friends days on holiday's. Oohhh and I'm going to a Valentine party too :) Woo Hoo!!! One of the bosses at work is throwing a little goodies party. MMMM, cupcakes, cookies, and candies. SWEET! You know I'll be taking pictures and sharing of course. Here's my easy peasy inexpensive Valentine. Valentine's don't have to be spendy to make some one's day. Adding Fizzy to family, friends and YOUR day is not about $$$$$$. It's about $ and maybe $$. Take one heart shaped box from the Dollar Tree, line it with a Valentine napkin from Dollar Tree cause who knows if the box is food safe right. Add some red hots (mmmm) , Sweetheart Cinnamon tea, the rest of the box of tea is mine :) and some homemade chocolate peanut butter lips, Sooooo much better than Reeses. Yep, you heard me. SO much better. Very cute! Love the homemade chocolate lips! Tiffany, really cute idea. Simple and so sweet. I bet those made the recipients feel quite special!